On October 12, 1492, Christopher Columbus’s expedition made landfall in what is now known as The Bahamas. 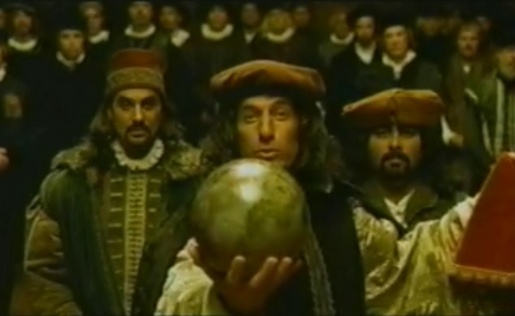 In honour of Columbus Day and Día de la Raza here’s a spot from 2004, a television commercial from GE’s Imagination At Work campaign. The Columbus ad was developed at BBDO, New York, by chief creative officer Ted Sann, executive creative director Don Schneider, creative director/copywriter David Johnson, creative director/art director John Leu, agency producer Regina Ebel, assistant producer Rachel Seitel, music producer Rani Vaz. Filming was shot at Universal Studios in Hollywood and in Spain by director Joe Pytka. Editor was Clayton Hemmert at Crew Cuts. Music was produced at DHMA by David Horowitz. Special effects were produced at Quiet Man. Actors in the commercial were Carol Abney, Matt Gallini, Clive Kennedy, Curt Lowens, Braeden Marcott, Pierrino Mascarion, Maximo Morrone, Johnny Ray Nelson, Matthew Poretta, Wendy Hoff Preston, Stuart McLean, Michael Bellsfield, Frode Kjoven and Rudy Quintanilla.